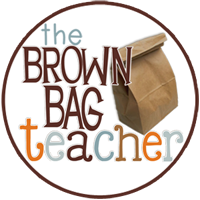 Catherine from The Brown Bag Teacher is hosting a book study on Donalyn Miller's new book, Reading in the Wild. I am one of the rare people who actually have NOT read her first book, The Book Whisperer (even though it's been sitting on a shelf in my house since last summer...eventually I'll get to it). But, I wanted to join in on this study anyway since it sounded like it has lots of practical applications to the classroom and I've heard nothing but good things about her other book. 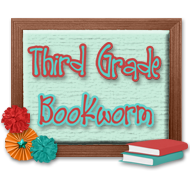 This week's hosts are Third Grade Bookworm and Think, Wonder, & Teach. 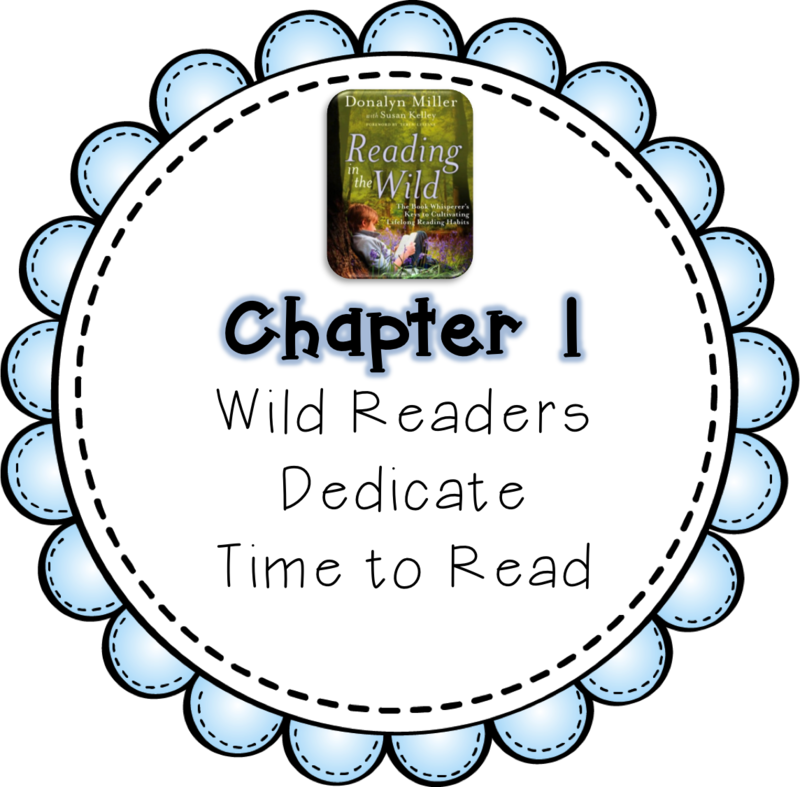 Today everyone will be sharing their thoughts and important points from chapter 1 - Wild Readers Dedicate Time to Read. This chapter is very much common sense...students that read more are better readers and perform better overall. We know this but still struggle with getting every student to actually read. 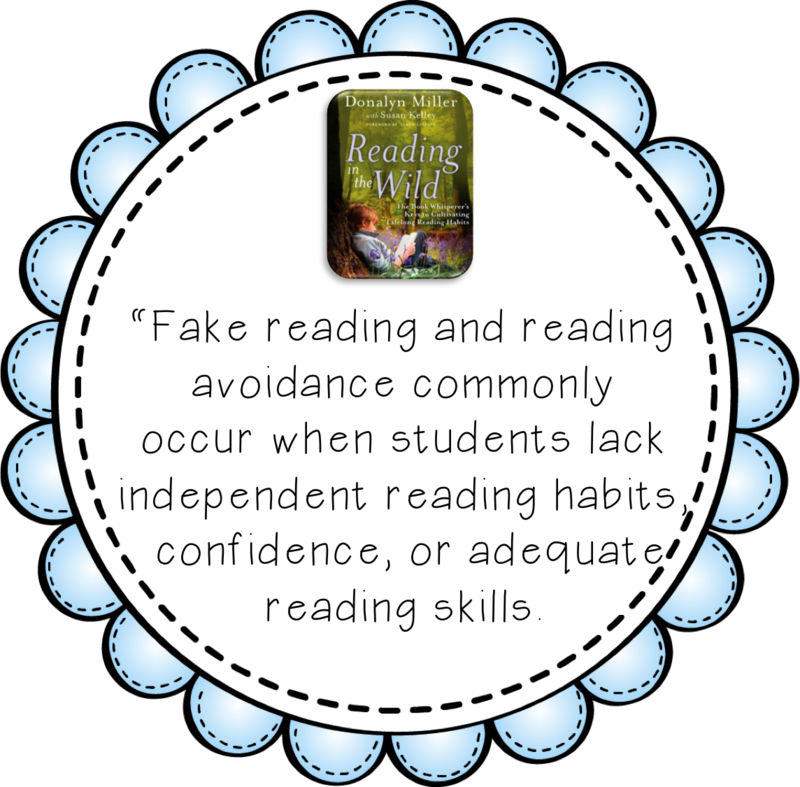 Miller offers some simple, doable suggestions for turning students into "wild" readers, both at school AND at home. How many times as adults do we hear ourselves saying that we haven't had time to read in forever? (Until now, on summer break!) 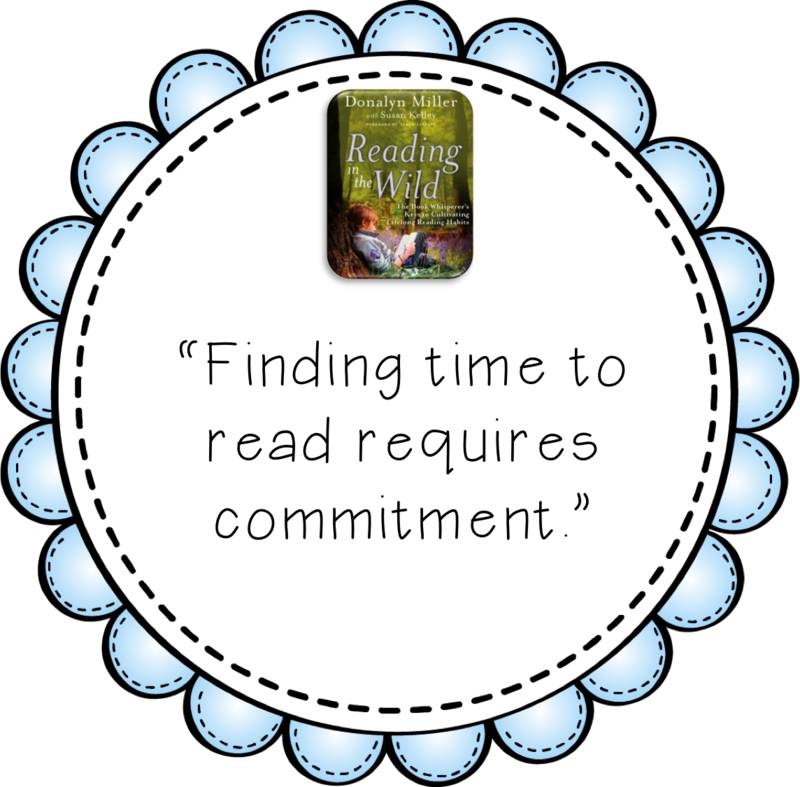 If we as adults cannot devote the time to read over other things, how can we honestly expect our students to find reading more important than video games, soccer practice, going out for ice cream, etc.? I know I tell my students how important reading is all the time, but then I hypocritically always feel like I have more important things to do. One of my favorite parts of this chapter was when Miller discussed with her students WHEN they could sneak in moments to read throughout the day. She sort of challenged her students to find extra reading minutes (even if they were scattered about) and encouraged them to share their findings. I could definitely see even my second graders getting into this. The same goes for in school. Kids could be reading in the bathroom line, while waiting in the hallway, the list goes on and on. Another important point was that students (and adults) should always have a book on hand in case they find themselves in a situation where they have an extra moment of free time. Instead of playing on an iPhone, a book could be read. 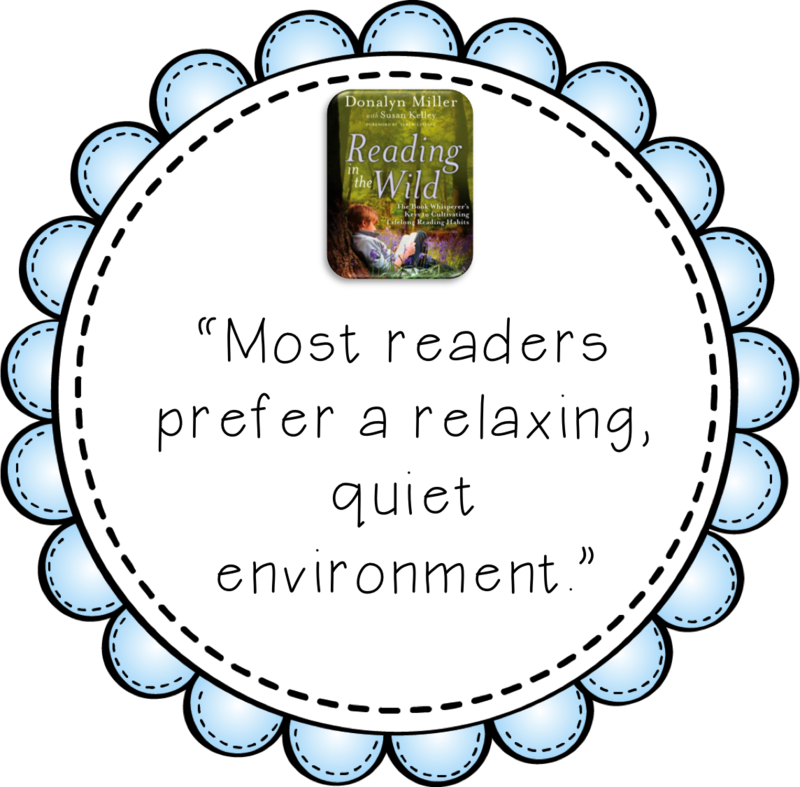 The finding that most students prefer to reading in a calm, comfortable and quiet environment was not surprising to me. This is likely the reason students are more on task with their reading when they are able to lie on the floor, find their own nook, grab a pillow, and the entire class is peaceful. When you walk into a classroom with everyone moving around, talking, etc. students simply aren't focused on reading. I imagine it may be harder for students to find quiet places at home to read if it is not set up for them, especially with larger families or other siblings. Everyone knows the fake readers. The ones who always have something else that has to get done when it's time to read. Or the ones who change their book every five minutes. Or the ones who spend most of their time fidgeting, moving spots, or talking to someone nearby. Miller suggests spending a few days monitoring these students and taking notes on their engagement. When are they NOT reading? When ARE they reading? What are they doing instead? By doing so you are likely to find a pattern of behavior and be able to get to the root of the problem, whether it be seating, other distractions, needing engaging or appropriate reading material, etc. 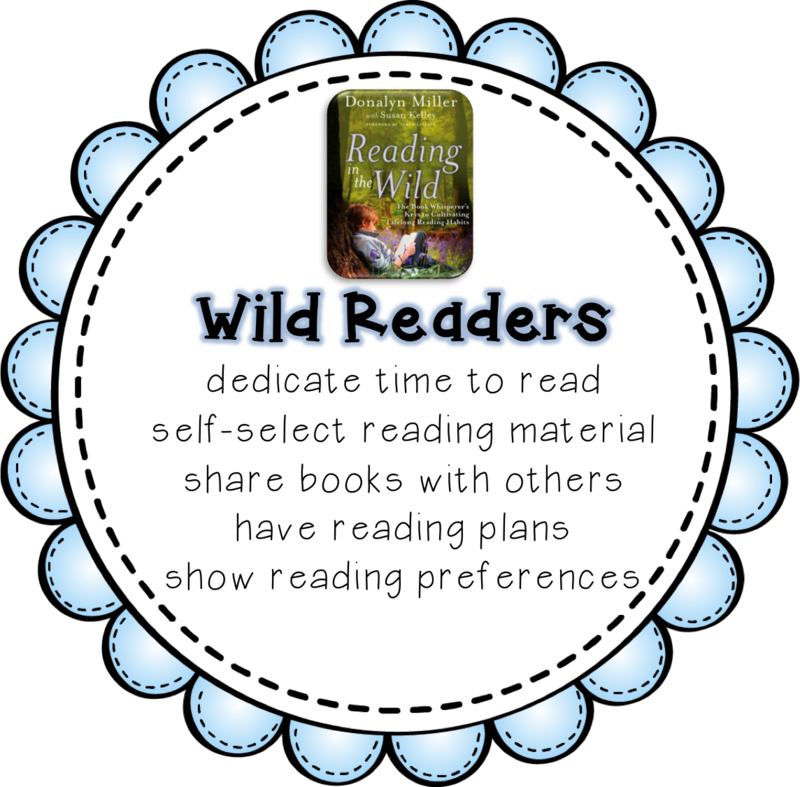 Do you consider yourself a "wild reader"? To be perfectly honest, I do not anymore. Before summer began, it was a long time before I read an entire book...probably last summer. As a child though, I was a wild reader. I would binge read series books like Nancy Drew and The Babysitter's Club to the point my mother was tired of buying them. I don't know what happened, I guess life has gotten in the way, but the book is making me realize it is hypocritical to expect my students to become wild readers when I don't engage in that behavior myself. I agree with you- I used to be a wild reader but I'm not anymore. I am committing to become a wild reader again, though! Great synopsis! I finished the first book this last week, but haven't started the second, yet. I don't think you need to read the first one. It's more about igniting the passion for having student read. There's not much practical application. I tend to read "eye candy" book during the school year. I read each night before bed. It's how I put myself to sleep. During the summer, I'm finding myself reading more professional books sine my mind is freer from school-related things. I look forward to hearing more about the book! I just finished her first book last night. I feel like a lot of those same important points were made in the first book. 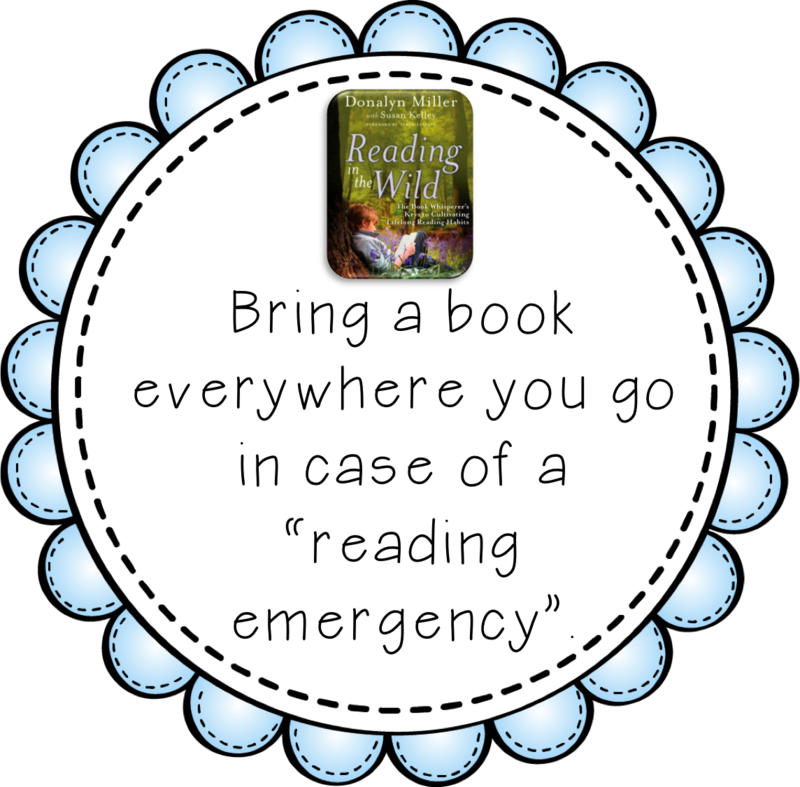 I'm definitely guilty of not modeling the best reading behavior to my students. I'm excited to become more of a wild reader like I was as a child. Babysitter's club books were my favorite! I do try to always have a kindle book going so I can read it on my app when I have a few minutes or when I'm walking the dog. That helps me get a few books in during the school year! It's funny, I just read "for fun" the first week of June when we went to the beach (I read in the car while my husband drove). I hadn't read "for fun" since my 3 year old was born! And I LOVE to read! I just don't make time. Now, I'm trying to read a little each night before I go to bed, hoping it will help me sleep (since I have trouble with that). I'm the worst about not having read-aloud time just for the sake of reading in class. Every year I say I'll do better, but then it gets shoved to the side in lieu of something else! I'll have to do better!! Thanks for sharing your thoughts on this chapter! I haven't read the book! I can totally connect with your experience- when I was young, I was definitely a wild reader (I binged on The Babysitter's Club, too!!). Unfortunately I cannot consider myself a wild reader anymore, either. I have no recollection of ever not being a voracious reader, however after reading The Book Whisperer a few years back, a passion for reading and sharing it with students was relit. Loving the follow up book so far....practical ways to do that sharing and hopefully igniting students! I was most definitely a wild reader for most of my life and then I had children! I think I was a wild reader at that time, as well, the books just weren't mommy books. Then I became a teacher and reading became work, so I only read wildly every summer. I laugh as I write because I can say that I am a wild Netflix user, lol. I am going to make myself become the wild reader I once was, the reader that read Judy Blume vigorously and repeatedly! Jessica, we are so alike! I didn't read the first book either, but I signed up so I would HAVE to read and finish! 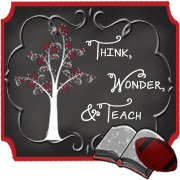 I never have time to read for pleasure-I read professional books or preview kid books for my classroom. I had talked my principal into a school wide reading time on Fridays a couple of years ago where even the teachers had to read so the students saw us as "readers" and I LOVED that time! I don't think I have ever been a "wild reader". Definitely a fake reader in high school & college! And always a bit more of a reader in the summer. One way my kids & I have been able to "steal time" to read (as well as enjoy books together) has become audio books in the car. I can read to them at bedtime (and I just read them The One and Only Ivan which was fabulous), but it has been great to share audio books together in those times I cannot read to them! It has allowed me to enjoy SO many more books than I otherwise would be able to. 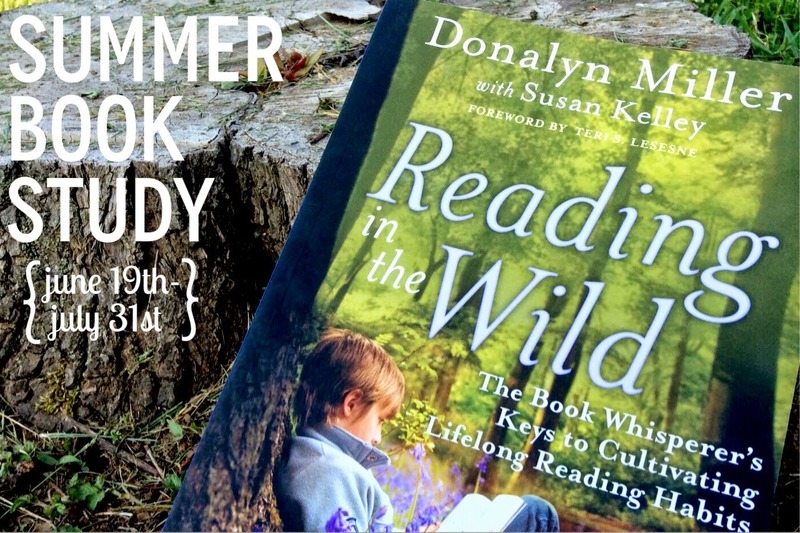 Of course, now that it is summer, I am determined to carve out quiet reading time as well...and so happy to be enjoying Reading in the Wild! I found that when I'm more connected with other readers (like on Goodreads), I'm more likely to keep up with my wild reading habit. I love seeing what my friends are reading, their reviews, their wishlists, etc. It motivates me to keep carving out time to read myself. I was a total BSC and Nancy Drew girl myself, with a little Sweet Valley High thrown in. :) Loved your post!! As a child, I was not a wild read. I read when I was bored and there was nothing else to do (ie my grandparents house in a town with a population of 39 and no tv). I didn't become a wild reader until I was pregnant with my first child and on bed-rest. Since then I have developed the habit! I'm a former wild reader as well. All the way up to college, I was seldom without a book and the library was one of my favorite places to be. Now I devour books in the summer and then I allow life to get in the way when school starts. My personal reading time needs to become a non-negotiable item on my daily schedule...right up there with time for personal fitness, and..... Yikes! It's amazing how easy it is to 'drop' those things so important to our own self-nuturing during the school year.